KCG College of Technology and MSME –DI jointly organized a 6-week ESDP for SC Women – an initiative of the E Cell of KCG-taking its first steps towards CSR! The programme was organized at the college premises in Karapakkam, Chennai in association with MSME-DI to train 20 underprivileged, SC category women on agro-based skills so that they are empowered to start their own business and earn a decent livelihood. The participants were trained on basic managerial skills like time management, planning, organizing, customer orientation, quality controls, etc. They were exposed to learning agro based products manufacture like Pickles, appalams, jams, etc. and also, household chemicals, candle making, paper cup/plate making. 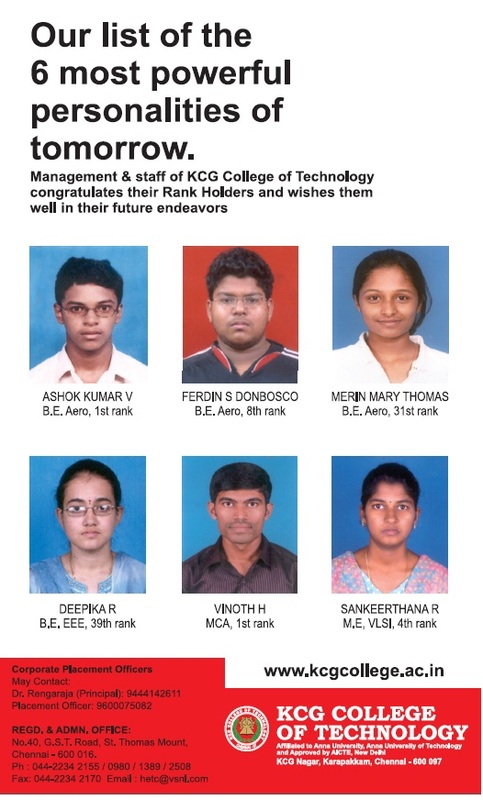 KCG College takes immense pleasure in introducing our rank holders.